And yet, while we worship God alone, it is clear that we likewise worship the Humanity of our Savior Jesus Christ. Furthermore, the worship we give to the Sacred Humanity of our Savior (as also present in the Holy Eucharist) must not be distinguished from the adoration we give to the Blessed Trinity. We must not say that there are two “adorations” given to Jesus, one in respect of his divinity and another of his humanity – but there is one only person whom we adore both in his divinity and in his humanity. Hence, we worship the divinity of Christ and also “his flesh” with the same single adoration, which is likewise given to the Father and the Holy Spirit. Yet, we may ask, How is this reconciled with the words of our Lord, The Lord thy God shalt thou adore, and him only shalt thou serve? We know that none is to be worshiped save God alone, and yet we hold that the humanity of Christ is so intimately united to the divinity as to be worshiped with one and the same act of adoration as is the divinity. Precisely because the humanity of Jesus is hypostatically united to the divinity – that is to say, the humanity and divinity are united in a single Divine Person who is God the Son – this sacred humanity is worshiped in one and the same act with the divinity. For more on this, see Summa Theologica III, q.25 [here]. Now, the humanity of Christ is united to the divinity as the instrument of our salvation – for it is through the incarnation that we are saved, and it is in his most sacred flesh that we find the fullness of all grace which is poured out upon humanity. Hence, we say that it is truly God who saves us, and yet we likewise affirm that by his wounds you were healed. Salvation does indeed come from the Lord, but through the humanity of our Savior. And, thus, the humanity of our Lord is so intimately united to the divinity in the work of redemption as to be properly called the “instrument of our salvation” – not after the manner of a separated instrument which is taken up for a moment and then cast aside, but rather as an instrument united to the author of all life. The Cross is likewise to be call the instrument of our salvation – For by your holy Cross, you have redeemed the world. It is through the Cross that we come to the waters of life, and there is no salvation outside that won by Christ through his holy Cross. Here we do well to ask: Is the Cross a united or separated instrument of salvation? Is the Cross a tool taken up only for a moment and then cast aside, or rather is it not an instrument so closely united to our Savior as to symbolize his very person? 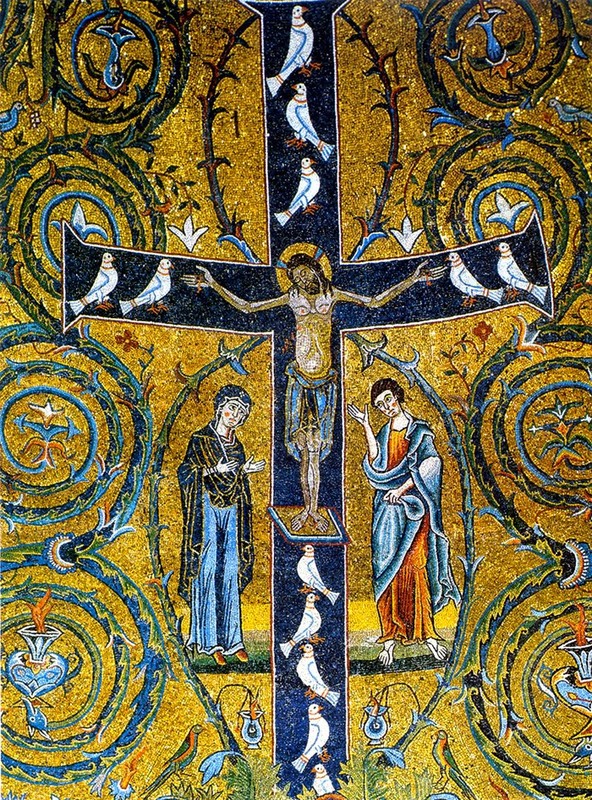 On the feast of the Exultation of the Cross, we recognize that the Cross was no mere tool used and then discarded, but rather is an instrument of salvation united to the humanity of Jesus in the work of our redemption. This is why the Cross continues to bring health and salvation to the world – this is why the Cross of our Savior will appear in the heavens on the day of Judgment. We now turn to the considerations of the Angelic Thomas, as he discusses the union of the Cross with Christ. Hence, we may go so far as to state that, even as one must not divide the humanity of Christ from his divinity, neither is it possible (after the redemption) to divide the Cross of our Savior from his Divine Person. O glorious Cross, your arms upheld the priceless ransom of captive humanity. Through you the world has been saved by the blood of the Lord. That's why i always cringe when some uneducated fools spew nonsense like: "Oh, western spirituality is stuck in the Good Friday...you must emphasize the joy of the Resurrection and let go of that Cross...because by mentioning Christ and Cross together it seems like Cross has won over Christ...".